There’s no denying it, when you are in a kayak, on the water, there is nothing more important than having a good paddle. You need one that has a streamlined design and that is made out of strong, durable materials. There is a lot to be said for this Werner Camano paddle. It is composed of fiberglass blades which gives it that perfect equilibrium between being lightweight but still quite effective. It is also mid-sized which means that regardless of the paddler or the paddling style, this paddle will function seamlessly. It also can easily be separated into two distinct parts, depending on how you prefer to paddle. While this paddle is certainly not cheap, it is well worth its price tag. This is because it has been carefully crafted to ensure that it functions incredibly well. The dihedral design on this paddle means that paddling forward will be a lot easier. This is because you will be able to move forward with a smooth movement and minimal effort. It has also been built to be durable so you don’t really have to worry about the paddle being banged around too much – it will survive. If all of this was not enough, you also get to choose from a variety of colors and patterns as well. You get to select from yellow, blue, red, and orange from a brightly colored paddle. Advanced dihedral power face , 52 x 16 cm, 650 sq in. 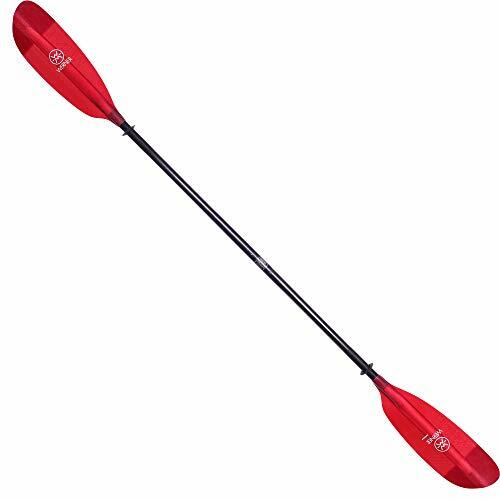 If you are just starting out with kayaking and are looking for something to help you along, you will find this Naviskin paddle quite useful. It is also great as it is quite a bit cheaper than many of the other professional paddles on the market. Nonetheless, you can still enjoy many of the same benefits as with more expensive paddles. Even younger individuals will have no problem with this paddle as it is quite lightweight and easy to manage. What makes this paddle even more conducive for kayaking is its feather blade design. This allows you to cut through the water easily and smoothly. Doing so propels you forward at a faster rate but with less effort involved. If you are looking for two separate paddles or just want a simpler way to store the item, they can be separated into two parts. The paddles are made from corrosion resistant material which means that you can expect to last you quite a while, not requiring a replacement. You also get several attractive options that you can choose from. You can opt for either the black, white, or blue paddle. Really don’t feel like spending a whole lot on your kayak paddle? Or perhaps, you only head out onto the water every so often. Either way, you may not be looking to make an investment in terms of kayak paddles. If this is your situation, the SeaSense paddle will be right up your alley. It is a good quality kayak but will not cost you much. It has a feathered blade design which works well as it allows you to move the water faster but without requiring too much of strength. It is also made of aluminum and is quite light. For the price that you are paying, you also get adjustable drip guards and a support ridge design to provide added strength. You also don’t have to worry about losing your kayak in the water. It has been made so that it floats in such an event. It has also been constructed so that you can divide the paddle in half, giving you greater storage options. The SeaSense paddle may not be the best option out there but is still a really great buy, particularly considering the quality that you get for it. The company states that this kayak paddle will make a great introductory paddle and they are right. There are several reasons for this including the fact that it will not break the bank. More importantly, however, the paddle is quite lightweight, weighing only a couple of pounds. The bar is constructed from light aluminum while the blades have been made from plastic. The blades sport a feathered design which allows the user to maneuver through the water more easily. They are also the perfect size to ensure that they perform optimally in the water. There are three locking positions which means that regardless of your paddling style, you will be well supported. The paddle is about 87 inches long but can be taken apart to form two paddles of equal length. The paddles are available in white, black, yellow, blue, and orange giving you a wide variety to choose from. 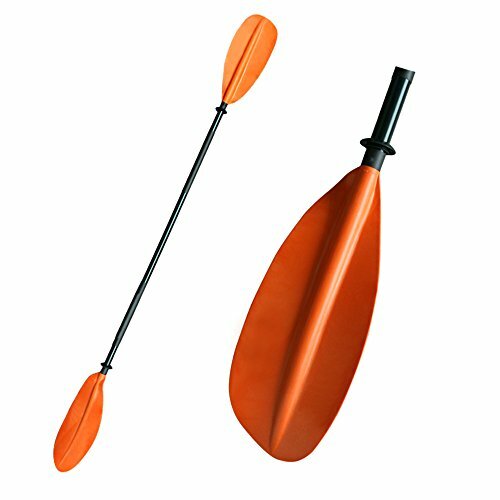 If you are looking for a middle of the road kayak paddle to take with you on your adventures, this Leader Accessories one will certainly serve you well. At the very least, it is a wonderful paddle to get started with when you first start kayaking. If you are looking for a kayak paddle that offers you the best in comfort, then look no further than this Shoreline model. It has been tailored to be as comfortable as possible. This is one of the reasons that this paddle is actually quite ideal if you are planning on taking a long kayak trip. You will have almost no complaints about discomfort or getting tired. The middle part of the paddle is made of aluminum while the blades are composed of finely designed plastic. They have been designed to make pushing through the water and absolute breeze and easy on your arms as well. This is topped off by comfort grips to make sure that you do not suffer from blisters or other small injuries. As an added bonus, it is also incredibly affordable! Conclusion: Don’t waste any more time spending hours looking up kayak paddles and which ones are the best to buy. You answer can be found in the list above. You will be able to find ones that are just what you need.